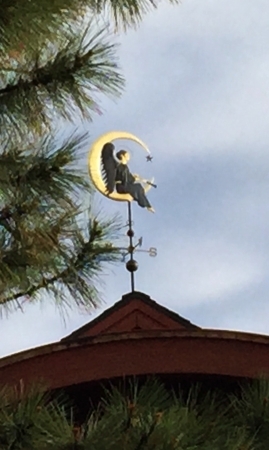 Our Angel Sitting on the Moon Weather Vane is depicted gently raising her trumpet as she gazes into the distance. 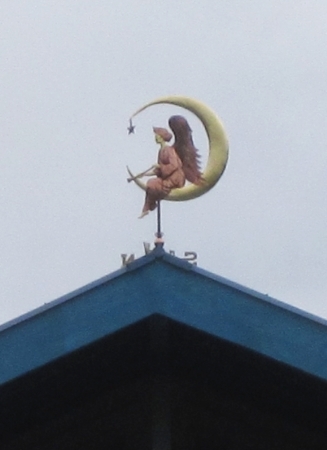 As shown here, she was crafted with optional gold leaf accents on her face, arms, and feet as well as the moon. As an option, we can also use optional silver colored palladium leaf on the moon, giving it a beautiful luminous glow, especially at dusk. Over time, the copper will first patina a deep chocolate brown before eventually turning a lovely turquoise green. 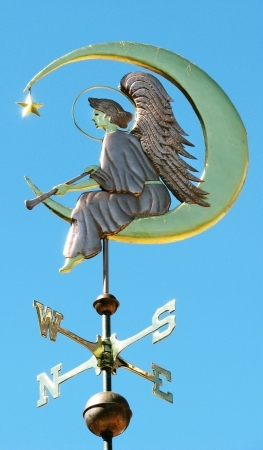 We have created several customized versions of this weathervane using optional gold and palladium leafing. These leafed accents will create a bright contrast throughout the weathering process. 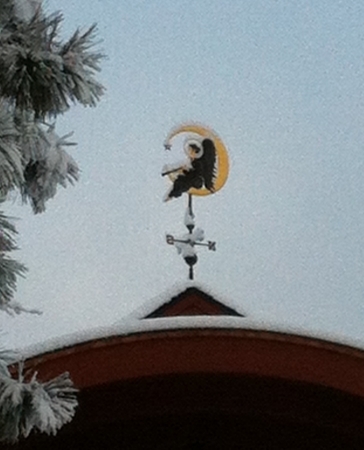 There is a century-old good luck tradition in weathervane making. The craftsman places a copper penny, from the year the weather vane was made, inside the sculpture piece for both luck and historical significance. 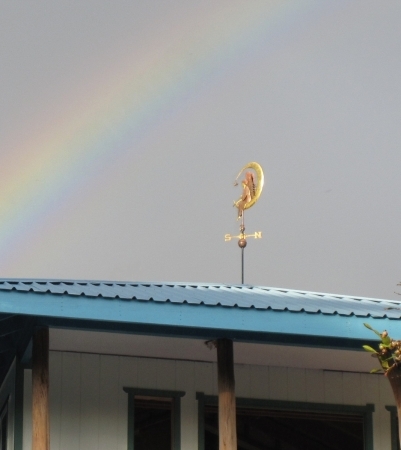 Because we handcraft every weather vane to individual order, we offer our customers the opportunity to additionally put special pennies inside their weather vanes based on important years in their lives. For one of these weathervanes, our customer selected special ‘lucky pennies’ representing the birth years of each family member. 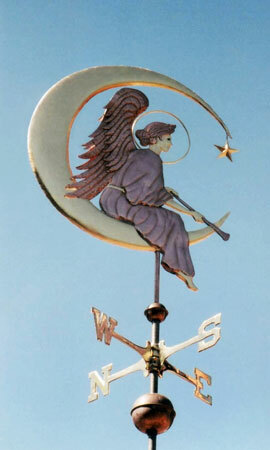 They wanted their ‘lucky’ pennies placed inside the star suspended just below the tip of the moon. 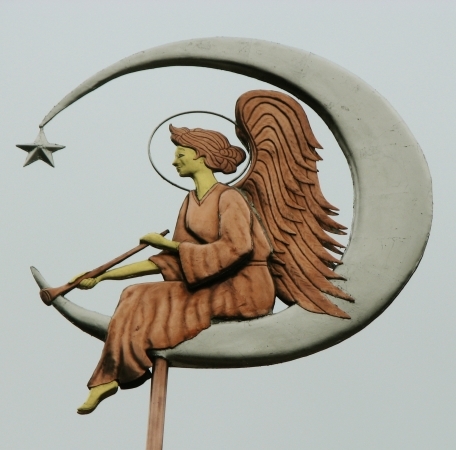 Their thought was that when they looked up at their guardian angel, not only would they see the star containing their ‘lucky pennies’ but they could also make a wish upon that star, thus bringing additional good fortune to their home and family members. 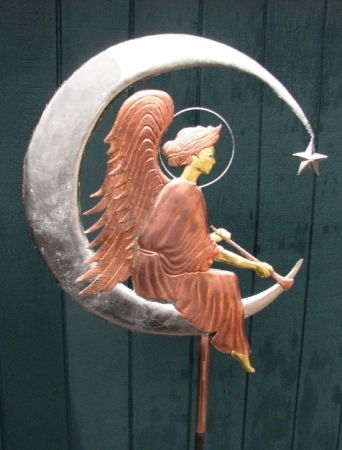 We have also made several versions of this angel weathervane in memory of a loved one who has passed on. 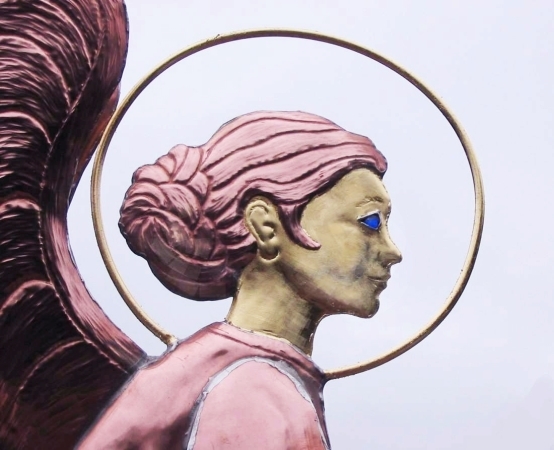 The angel’s peaceful contemplative features and far reaching gaze make her a special tribute to a life well lived.